If you’re a beginner, from your first lesson you will be able to play a simple tune! If you can play already, our online violin teachers Liz or Kelsey, will take you to the next level! All styles from classical to folk! Learn at your own pace with our online violin teacher Liz who has been teaching violin for over 25 years. 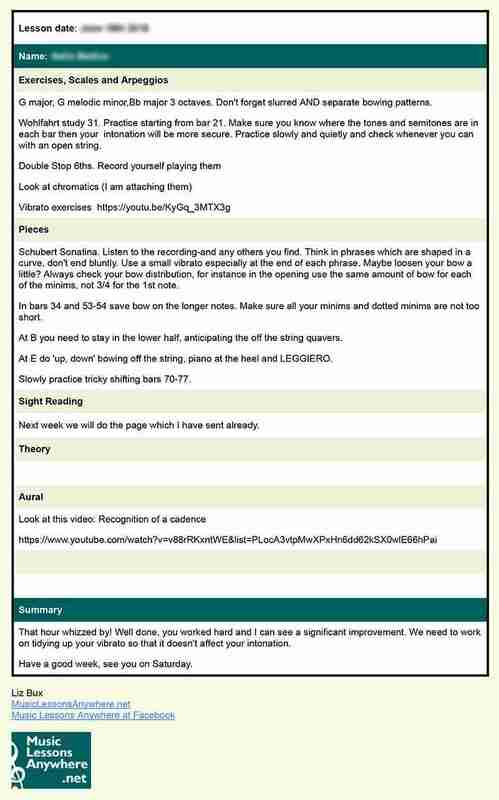 We provide you with all the materials you need, by email, before each lesson and we send you detailed lesson notes after each lesson, so you can see what was covered in the lesson, focus on what to practise and track your progress. Whether you want to learn violin for fun, to learn to play a particular piece, or to take ABRSM Music Exams, we can help you! Online violin lessons with Liz or Kelsey are fun and you will soon be playing with confidence! 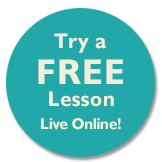 After you submit your enquiry for a free trial online violin lesson, Tracy will get back to you by email to arrange a time to meet for a chat over Skype, answer any questions and to arrange your free trial violin lesson. A live Skype violin lesson online by our teacher Liz (on screen). Liz also teaches piano and music theory. “I live in a small town in North Dakota (USA). I happened upon Music Lessons Anywhere during a search on Google. I was able to secure lessons for my 7 year old daughter in piano and lessons for me in violin. Read more about Liz’s biography here and Kelsey’s biography here. Liz and Kelsey also teach groups of students online, together in the same location or together from different locations using Skype or Google Hangouts. Costs for a shared online violin lesson can be split amongst students taking the same lesson! Liz and Kelsey make learning to play violin online fun! The price of our Online Violin Lessons for individual students (live one-to-one tuition) is £30 per hour. The cost for Online Violin Lessons for groups is £40 for an hour shared by two students or £50 for an hour shared by 3 to 5 students (maximum 5 students to a group lesson). “Learning to play violin is my dream since childhood. 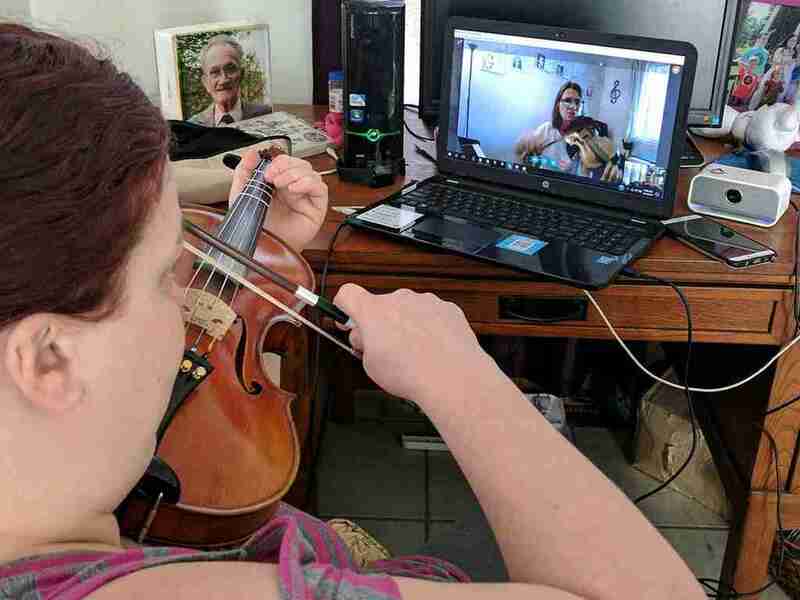 Since I have been using Skype to learn several foreign languages for years, I started thinking that maybe I can learn how to play violin via Skype too. I found ‘Music Lessons Anywhere’ web site and I decided to give it a try. After the consultation session with Tracy, I am assigned my violin teacher and I am so glad to start my learning journey. My teacher is not only fun and supportive, but also very patient throughout the lesson. As a total beginner, I am so nervous in playing violin all the time and always make mistakes during the lesson. My teacher is very helpful to solve all my problems and even gives me a lot of useful tips for practicing violin more efficiently.